Eighteen million people are affected by unsightly and sometimes painful keloid scars, and many of them go through life believing treatment for this embarrassing condition is next to impossible, if possible at all. You can help restore your patient’s confidence and self-esteem by offering keloid treatment with Superficial Radiation Therapy (SRT therapy) following surgical removal. The SRT-100™ is a highly effective keloid treatment with a cure rate of more than 90 percent, and a recurrence rate below 10 percent (compared to rates as high as 90 percent after having surgery). SRT therapy delivers a precise, calibrated dose of Superficial Radiation Therapy, safely destroying the cells that form keloids, keeping the skin smooth as the incision heals. This non-invasive, painless keloid treatment is performed right in your doctor’s office. Patients may require a series of treatments, depending on the incision site. It has been approved by the FDA to treat keloid scars and has earned the moniker “The Keloid Cure” for its ability to successfully eliminate keloids. The power of SRT therapy doesn’t end with keloid scars. Sensus Healthcare’s SRT-100™ has also been approved for treatment of non-melanoma skin cancer. SRT therapy is the non-surgical choice for the treatment of non-melanoma skin cancers. This treatment method is safe and effective, and involves no cutting, bleeding, or stitching. With the SRT-100™, there is no need for anesthesia, no risk of infection or scarring, and no need for reconstructive plastic surgery due to unsightly scarring after surgery. Perhaps most appealing, the SRT-100™ has cure rates comparable to those of surgical skin cancer treatment options. Patients who undergo treatment with the SRT-100™ heal quickly, with no downtime or lifestyle restrictions following treatment. SRT therapy with the SRT-100™ is ideal for patients with health risks that prevent them from undergoing surgical treatment, or patients who wish to avoid the pain and scarring associated with surgery. 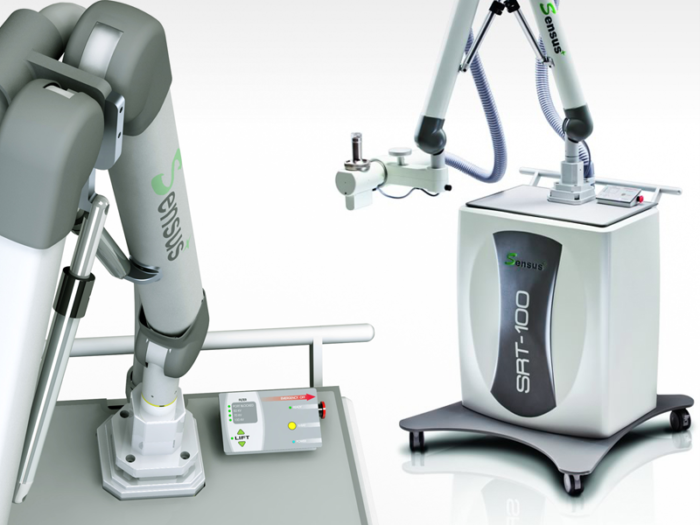 For the physician, the SRT-100™ offers many unique features including: broad range of motion; compact, mobile design, precise and accurate x-ray delivery; variable applicator sizes; and replaceable contact shields. It’s time to offer your patients a non-surgical, painless and effective keloid scar and non-melanoma skin cancer treatment. Contact Sensus Healthcare today to learn more about the SRT-100™.